Expect the unexpected. Autograph cards for Tom Brady, Dan Marino and John Elway will be included in 2014 Topps Five Star... Baseball. That is not a typo. The three superstar QBs have been included in the high end hit centric release of baseball legends, superstar veterans and on the rise rookies. Before Tom Brady started taking snaps for the New England Patriots or even the Michigan Wolverines, he was drafted by the Montreal Expos in the 18th round of the 1995 MLB Draft. His position at the time was catcher. The 1979 MLB draft saw a lot of name players selected, Andy Van Slyke, Tim Wallach, Steve Howe and Don Mattingly to name a few. Selected in the 4th round of the 1979 draft, 99th overall, by the Kansas City Royals was Dan Marino. Marino decided instead to go to the University of Pittsburgh to QB for the Panthers. That same year the Kansas City Royals selected another future football great, John Elway. Elway also chose college, going to Stanford where he played both football and baseball for the Cardinals. But in 1981 he was drafted again, this time by the New York Yankees. He was chosen in the second round, 52nd overall, in a draft that included Tony Gywnn who was selected later in the third round. Elway actually played in the Yankees farm system in the summer of 1982 where he had a very respectable .318 batting average and a perfect fielding percentage. It was the Yankees intention to bring Elway to the Bronx as the starting right fielder by 1985. If it had not been for the 1983 NFL draft it is entirely possible that Elway could have been in permanent pinstripes, knocking Ken Griffey Sr. to the bench and sharing the outfield with Rickey Henderson and Dave Winfield. 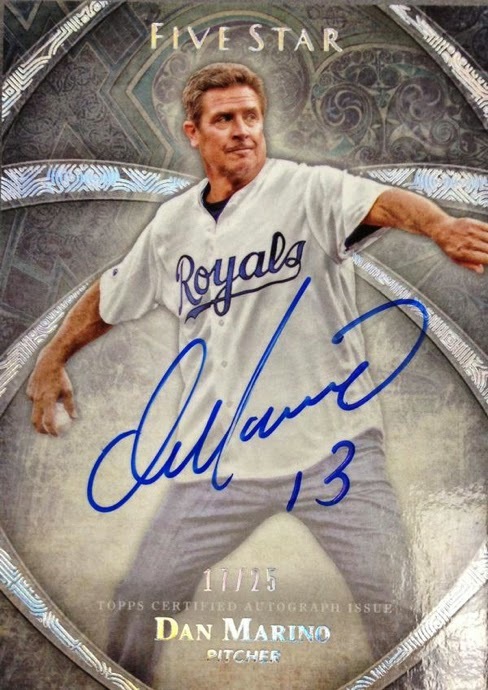 Elway will appear in 2014 Topps Five Star Baseball as a Yankee. I like these quirky cards featuring some of the 'What Could Have Been' scenarios, although these particular cards I will have to admire from afar, unless Five Star has base cards. I don't even know if it's a hit-only product. I'd sure like to get one of those Elway autos, though.